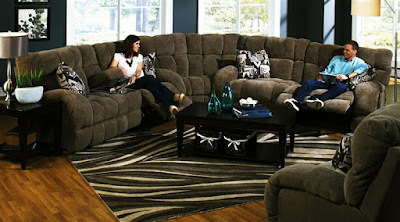 This 3 Piece Sectional includes a Lay Flat Reclining Sofa, Wedge, and Lay Flat Reclining Console Loveseat. Matching Recliner is also available. The Siesta Collection by Catnapper brings all the best features you can find. This group offers casual comfort design with decorative toss pillows and super soft heavy weight polyester fabric upholstery available in three colors: chocolate, wine, and porcini. All the pieces provide extra wide seating and tall back, as well as manual or power lay flat reclining mechanism. The console loveseat features storage and cupholders. The entire Siesta Collection includes: Reclining Sofa, Reclining Console Loveseat, Queen Sleeper, Recliner, Power Reclining Sofa, Power Reclining Console Loveseat, Wedge, Power Recliner. To see the entire Siesta Collection click here.